Blood Orange’s Dev Hynes and former Foreign Born member (remember them?) Ariel Rechtshaid know a thing or two about hit-making. They teamed up previously for Sky Ferreira’s “Everything Is Embarrassing” and Solange’s “Losing You.” On his own, Ariel contributed significant co-writing and production to Charli XCX’s True Romance, co-wrote Usher’s “Climax,” produced Haim’s Days Are Gone and Vampire Weekend’s Modern Vampires of the City, and plenty more. In addition to Dev’s own project Blood Orange (and past projects like Lightspeed Champion and Test Icicles), he can be found contributing to Florence & the Machine, Kyle Minogue, Theophilus London, almost Britney Spears and more. Now Dev and Ariel are teaming up once again to work with the voice behind “Call Me Maybe,” Carly Rae Jepsen, as the above instagram points out. 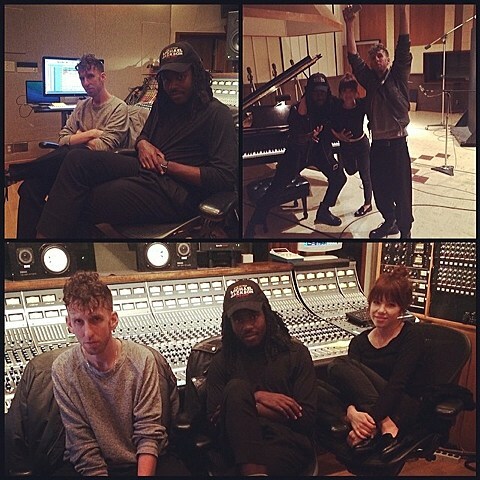 “Recorded one of my fav songs today with – @devhynes and @arielrechtshaid,” Carly writes. Could be interesting.